Throughout the 1950s and 1960s, when Joe and Joan went climbing in the Cascades and Canadian mountains, sometimes for weeks at a time, they left three young children at home. How did they manage it? 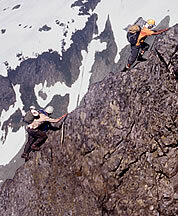 When Carla was 13 years old, Joan took her on a day climb of Pinnacle Peak in the Tatoosh Range. A year later, Joe took her up The Tooth near Snoqualmie Pass. After that, her parents said she needed to take The Mountaineers climbing course. Joe and Joan continued doing ambitious trips that were beyond Carla’s ability at the time. Carla completed the Basic and Intermediate climbing courses when she was 15 and 16. In the summer of 1969, following her junior year in high school, Carla was invited on her first big trip. The plan was to traverse from Colonial Peak to Eldorado Peak. This cross-country route had never been traveled before and it offered the prospect of first ascents in the Austera Towers NE of Eldorado. In two days of good weather, Joe, Joan and Carla, with Dave Knudson and Frank deSaussure, traveled to the head of Neve Glacier and climbed Snowfield Peak and The Needle. Fog and rain caught them for several days and white-out navigation was required to descend into the “McAllister Hole,” the deep cirque beneath the icefalls of McAllister Glacier. “We were so cold we had to build a fire at lunch just to get warm enough to be comfortable,” recalled Carla. They scrambled up a frightfully steep and unstable moraine to the divide near Austera Peak, first climbed by Joe, Joan, John and Irene Meulemans, and Tony Hovey four years earlier. Good weather returned just in time to tackle the Austera Towers. “I think we climbed every single one of them practically, didn’t we?” recalled Carla. “Yeah, we bombed that whole ridge,” laughed Joe. Remarkably, their original plan was to continue to Park Creek Pass via Moraine Lake and the Forbidden and Boston Glaciers. But time lost due to bad weather nixed that part of the trip. From their camp next to Klawatti Peak, they retrieved a food cache at the base of Eldorado Peak, which Joe recalled was “a welcome restoration of our ability to continue eating.” Eventually they descended to the Cascade River and caught a ride back to their cars at Colonial Creek campground. The following summer Joan, Carla, Dave Knudson and Peter Renz completed the Goodell Creek horseshoe, another pioneering traverse. This 1970 trip is described in the Picket Range section of this article. In 1971, it was Alan Firey's turn to do a big trip in the North Cascades. The goal was to traverse Ragged Ridge from Red Mountain to Easy Pass. The Fireys and Meulemans had climbed the highest peak on the ridge, which they called Panther Peak (now called Mesahchie) during a 1966 trip that included first ascents of Mount Arriva and Meulefire Peak. 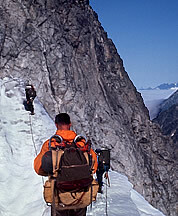 John Roper and partners subsequently climbed the other main summits of Ragged Ridge from the south. But nobody had traversed the north aspect of these peaks, which is mantled by glaciers and is by far the most scenic side of the ridge. Unfortunately, June 1971 was cold and snowy, so the party which included Joe, Joan and Alan Firey with Jerry Swanson attained few summits during this trip. 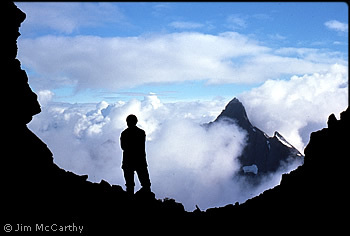 Joe wrote in the 1972 Mountaineer, "Our hopes of making some ascents from this side were dashed by heavily-laced snow on the rock and frequent powder snow avalanches. 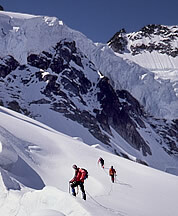 In fact, skis would have saved us some arduous snow wading." They continued to Fisher Creek Basin and Silent Lakes, and took consolation in the first ascent of Repulse Peak. The name was suggested by Alan, not yet fifteen, in memory of the British battleship sunk by Japanese aircraft during World War II. They had originally planned the trip as a grand loop, traveling west to Mount Logan and returning to their starting point from the head of Thunder Creek. But because of weather delays, they ended the high route at Silent Lakes and returned to Thunder Creek via Fisher Creek Basin. The last of the grand traverses pioneered by the Fireys was planned by Joan and Irene Meulemans. It was a horseshoe traverse around the headwaters of Bacon Creek from Mount Triumph to Diobsud Buttes. 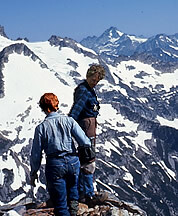 Carla and her husband Jim McCarthy joined Joan and Irene on this 1976 trip, which began at Thornton Lakes. They bypassed Mount Triumph, climbed Mount Despair, and traversed the east side of Despair to “Mystery Ridge,” which they followed westward to Berdeen Lake. Jim and Irene climbed a steep peak just north of the lake that had been ascended only once before, by geologists Rowland Tabor and Dwight Crowder. The entire party climbed Mount Hagan and Bacon Peak then made the first ascent of the highest of the Diobsud Buttes, called “Electric Butte.” Continuing along the NE flank of Diobsud Buttes, Carla recalled, “It was extremely steep, vegetated rock—very convoluted—just one little valley after another. You’d go up—really steep up, really steep down—just hanging on shrubbery. It was really kind of awful for a stretch there until we got farther along the ridge.” Eventually they reached logging operations on the SE flank of Diobsud Buttes and caught a ride down to the Skagit River. Unable to hitch a ride along Highway 20, Jim walked all the way back to their car on the Thornton Creek road. 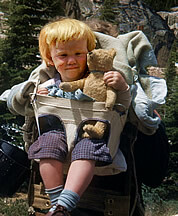 Joe and Joan introduced their children to the mountains early. In the summer of 1952, when Carla was just a couple months old, the family traveled from California for a camping trip near Cascade Pass. Joe wanted Joan to see the North Cascades, so they hiked with baby Carla to the Sahale Glacier one day and to a viewpoint high on Magic Mountain another day. Family pictures show Joe feeding Carla with a baby bottle among the glaciers and moraines of the North Cascades. As the kids grew older, their parents took them skiing in the winter and did a family trip to the beach or mountains each summer. When the kids became teenagers, Joe and Joan tried to get them interested in mountaineering, both for its own sake and as a way to keep them out of trouble. The effort yielded mixed results. Carla, who became the most enthusiastic climber of her siblings, recalled the 1969 McAllister Creek traverse: “I don’t know why I went, because it made us a group of five instead of four. I think I was sort of an add-on,” she said. “No, I think we were hoping to get you out,” Joe remembered fondly. Carla met her husband Jim McCarthy in 1971, after her first year of college. 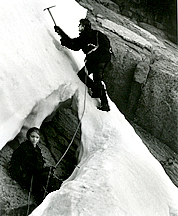 They were a climbing couple for several years and married in 1978. Jim is an accomplished mountaineer himself. His best known climbs in the Cascades are two demanding routes on the South Face of Forbidden Peak, put up in 1968 and 1977. Jim and Carla have climbed throughout the western U.S., specializing in hard climbing on granite. In 1979, they climbed the West Buttress of South Howser Tower in the Bugaboos together, with Carla making likely the first female ascent of that route.